Brian Wilson was born in Inglewood, California, in 1942. In biographer Peter Ames Carlin’s book, Catch a Wave: The Rise, Fall, and Redemption of the Beach Boys’ Brian Wilson, he relates that when Brian Wilson first heard George Gershwin’s “Rhapsody in Blue” it had a huge emotional impact on him. As a youngster, Wilson learned to play a toy accordion and sang in children’s choirs. In his teens he started a group with his cousin, Mike Love and his brother, Carl. His named the group Carl and the Passions in order to convince his brother to join. They had a performance at Hawthorne High School, where they attended. Among the people in the audience was Al Jardine, another classmate. Jardine was so impressed with the performance that he let the group know. Jardine would later be enlisted, along with Dennis Wilson to form the Pendletones in 1961. The first song Brian Wilson wrote would become “Surfer Girl.” A demo of the tune was made in February 1962 and would go on to be a Top Ten hit when it was released a year later in 1963. However, their first recording was a doo-wop-surf tune called “Surfin’” in October 1961. It was released in November ’61 on the Candix Enterprises Inc. label. The surprise for the group was that the record label had changed the group’s name from the Pendletones to the Beach Boys. Consequently, as each time the record was played by a DJ in America, radio listeners were being introduced to the Beach Boys. The name Pendletones was now history. Among the Top Ten hits The Beach Boys charted in Vancouver were “I Get Around” (#3) “Don’t Worry Baby” (#3), Help Me Rhonda” (#2), “Sloop John B” (#2), “Wouldn’t It Be Nice” (#1), “Good Vibrations” (#1) and “Barbara Ann” (#2). The B-side to “Wouldn’t It Be Nice” was “God Only Knows”. Though the song didn’t chart here on CKLG, it peaked at #5 on CFUN. 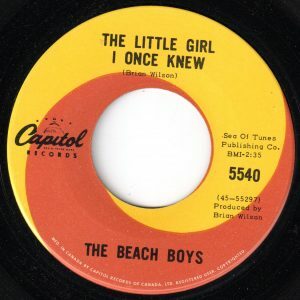 In the midst of a string of Top Ten hits in the USA, from “Help Me Rhonda” in May 1965 and “Good Vibrations” in November 1966, was “The Little Girl I Once Knew”. The song’s lyrics tell of a guy who knew a girl who he never paid attention to. But with the passing of just a few years, now he’s got eyes for her. Although she’s dating another guy, the narrator of the song is confident to elbow his way to the front of the line. According to him, it’s clear that her boyfriend isn’t the made of the right stuff, remarking “and look at how he holds her. I’ll be moving in one day. Split man.” Here, the Beach Boys offered up a taste of Sixties slang, invoking the directive to the girl’s boyfriend to “split,” meaning to leave the scene, take off. “The Little Girl I Once Knew” was the last new original song the Beach Boys produced before their critically acclaimed album Pet Sounds. The song was not included on any regular Beach Boys album, but has since been collected on several anthologies. “The Little Girl I Once Knew” is notable for innovative use of two dramatic periods of near-silence lasting several seconds each. In the mid-’60’s radio stations preferred to avoid dead air time. Consequently, the song was poorly received by radio stations, which may account for its relatively low chart rating among the Beach Boys other singles of the period. When “Barbara Ann” was released shortly afterwards, “The Little Girl I Once Knew” was dropped by numbers of radio stations who preferred to dedicate airplay to the more upbeat “Barbara Ann”. “The Little Girl I Once Knew” stalled at #20 on the Billboard Hot 100. But in Vancouver the song climbed to #3 in December ’65. Elsewhere it climbed to Boston, #3 Minneapolis/St. Paul, #4 in Toledo (OH), #5 in Fresno (CA), Newport News (VA) and Orlando, #6 in Dayton (OH) and Corpus Christi (TX), #7 in San Bernardino (CA) and Hartford (CT), and #9 in Seattle, Houston, Denver and Halifax. In 1966 “Barbara Ann” climbed to #2 in Vancouver in January. “Sloop John B” spent six weeks in the Top Ten, peaking at #2 in April. “Wouldn’t It Be Nice” climbed to #1 on September 3. And “Good Vibrations” topped the charts in Vancouver for the first three weeks in November. 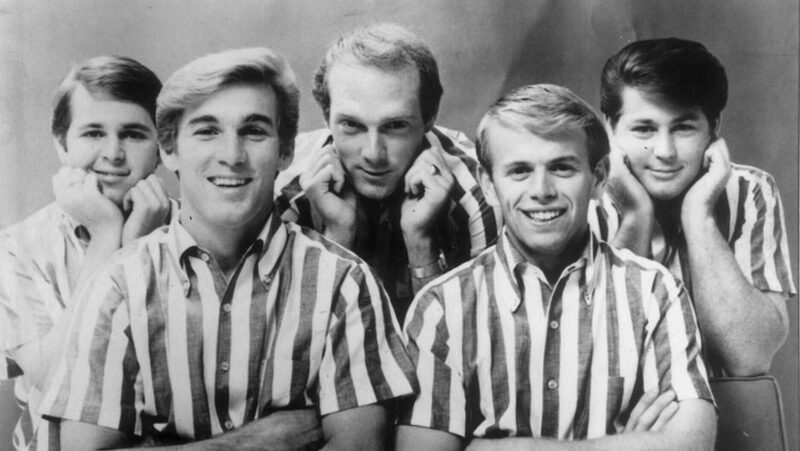 In Vancouver, 1966 was a stellar year for the Beach Boys. From 1967 onward, The Beach Boys chart successes were sporadic. “Wild Honey” peaked at #10 in December 1967, and “I Can Hear Music” stalled at #15 in April 1969. And “Good Timin'” climbed to #8 in Vancouver in the summer of 1979. But these were among the Beach Boys rare appearances on the pop chart in Vancouver. However, they have continued to tour over the decades. The Beach Boys have had four singles – “Good Vibrations,” “California Girls,” “In My Room” and “I Get Around” – and one album, Pet Sounds, inducted into the Grammy Hall of Fame between 1994 and 2017. Between July 13, 2018, and September 6, 2019, the Beach Boys have scheduled 78 concert dates across twenty-one states in the USA, as well as concert dates in Canada, Germany, France, Spain, Switzerland, Belgium, Denmark, the Czech Republic, the UK and Ireland. Silver Dollar Survey, December 18, 1965, CKLG 730 AM, Vancouver Top 40 Radio.com, Vancouver, BC. J. M. Kearns, “How Men Chose Women,” The Tyee, Vancouver, BC, February 17, 2006. Jeff Slate, “How Brian Wilson Found Inspiration in the Artists Working Beside Him,” Esquire, New York, October 11, 2016. Lambert, Philip. Inside the Music of Brian Wilson: The Songs, Sounds, and Influences of the Beach Boys’ Founding Genius. Continuum International Publishing, New York, 2007. The Beach Boys Concert Dates, The Beach Boys.com.